Your home state has always had your back. Now it has your hat, scarf, bag, or leash, too. 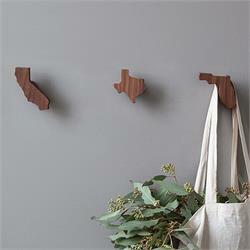 These wall hooks help you celebrate your favorite place every time you head out or come in. MADE FROM north american black walnut wood, danish oil finish. MEASUREMENTS 2.5" L x 1.25" W x 2.5" H.
CARE Wipe clean with dry cloth.